17 employees from Cumhuriyet newspaper went on trial on Monday (July 24) accused of supporting 'terrorist organisations'. Charged with terror-related offences in the wake of last year's failed coup, the defendants -- journalists, executives and lawyers -- made their first appearance in court since they were put in pre-trial detention nearly nine months ago. Each faces lengthy prison sentences of up to 43 years if convicted. Prosecutors are expected to argue that the newspaper aided members of US-based cleric Fethullah Gülen's movement (FETÖ) in addition to the PKK. 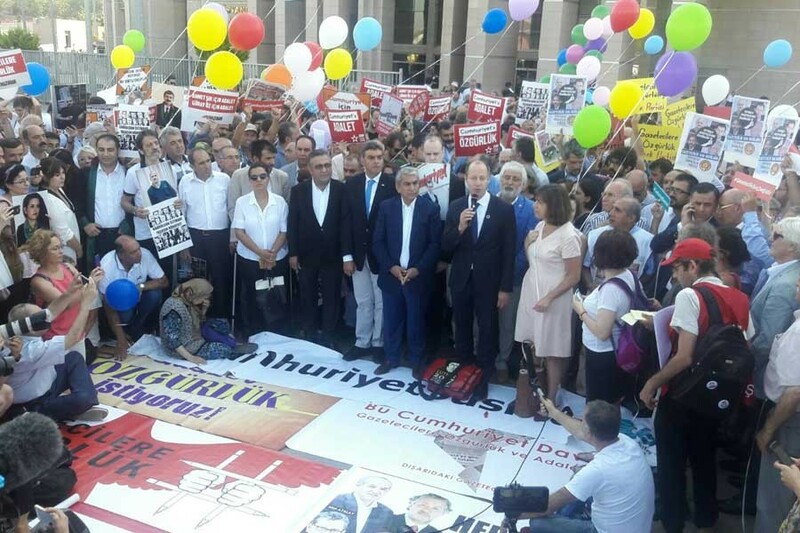 "Press cannot be silenced," chanted several hundred people gathered outside the central Istanbul court to protest against the prosecution of writers, executives and lawyers of the Cumhuriyet newspaper. Turkish prosecutors are seeking up to 43 years in jail for staff from the paper, including some of Turkey's best-known journalists, who are accused of targeting Erdoğan through "asymmetric war methods". According to the 324-page indictment, Cumhuriyet was effectively taken over by the network of Fethullah Gülen, and used to "veil the actions of terrorist groups". The newspaper has called the charges "imaginary accusations and slander". Social media posts comprised the bulk of evidence in the indictment, along with allegations that staff had been in contact with users of Bylock, an encrypted messaging app the government says was used by 'FETÖ' members. There are Mariette Cauchi from the International Senior Lawyers Project, Isaebelle Rossaert from PEN Belgium, Regula Venske from PEN Germany, Maria Emilia Arioli from PEN Switzerland, Steven Ellis, Henri Koponen, Barbara Trionfi and Marty Steffens from the International Press Institute, Jorgen Lorentzen from PEN Norway, Nora Wehofsits from the ECPMF, Mogens Blicher Bjerregård from the European Federation of Journalists, Johann Bihr and Erol Önderoğlu from the Reporters Without Borders and EU MPs Arne Lietz and Rebecca Harms among the attendees. Cumhuriyet Daily Editor-in-Chief Murat Sabuncu, columnists Hakan Kara, Hikmet Çetinkaya, Aydın Engin, Kadri Gürsel, Güray Öz, cartoonist Musa Kart, Cumhuriyet Foundation Management Board members Attorney Bülent Utku, Attorney Mustafa Kemal Güngör, Önder Çelik, Bülent Yener, Editor-in-Chief of the Cumhuriyet Book Supplement Turhan Günay and Accounting Manager Günseli Özaltay were taken into custody on 31 October 2016.